Are Your CIOs Rising to the Mobile Security Challenge? In today’s mobile-driven world, businesses are working to understand how to harness the power of mobile. While mobile security can drive innovation for any company, it should be simple to use to achieve success. Many organizations have not leveraged the power of mobile security as a business enabler, but at Samsung Business Services, we make helping IT teams our priority. To help CIOs and CISOs become mobile-aware, they should understand what the business really wants out of mobile and use that to drive strategy, support and innovation. A simple mental shift can change the complete strategy. Business adoption of mobile has gotten ahead of CISOs and the CIOs they work with. If CIOs understand the threat horizon, CISOs can clearly identify what needs protection. Aligning efforts with mobile business strategy and value strategy helps CISOs regain influence and drive value for business as more activity gets driven by business units exploring new opportunities and mobile applications every day. A secure platform should ideally reduce risks associated with any daily tasks without impacting employees’ ability to get jobs done. User experience is critical for mobile applications as they are enabled with one touch of a swipe. 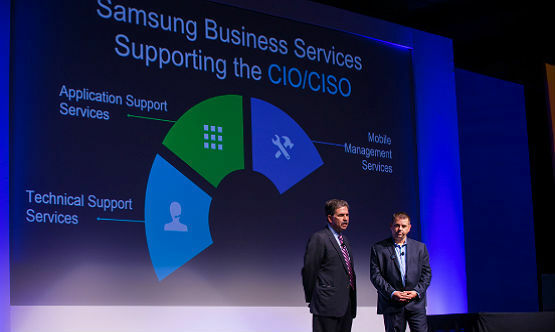 At Samsung Business Services, our team supports the CIO and CISO with a comprehensive suite of services – including application support, technical support, mobile management and security. We’re here to ensure mobile applications are secure at deployment. I discussed how CIOs need to think about mobile security as a business enabler, instead of an inhibitor in-depth at this year’s Gartner Symposium 2015 ITxpo. Click through the full presentation below for an overview. To help your organization, our Samsung Business Services team is here to find a solution that fits your business security needs.